This is my final post here at Blackbeans. To follow my new blog click here. There’s an interesting article over on the Anglican 100o site entitled Bad Reasons to Plant a Church. It offers an interesting glimpse at a secular perspective on church planting as well as a challenge to examine the real reasons to plant a church. Planting a church is not an endeavor to be entered into lightly. There are many hazards along the way. There is uncertainty and sacrifice, not least of all by the sending church. It is hard work that demands all that you can give spiritually, mentally, and emotionally. It is entrepreneurial but for the kingdom of God. I cringe at the thought of it being considered a franchise in some consumeristic way. In the course of the discernment process to begin planting Holy Trinity, and even now, it has been important to constantly hold this mission loosely, openhandedly before God and our community. It is vital to earnestly examine our hearts and be skeptical of our motivations. Planting a church is apostolic work. It is noble and it is important. But we do not seek to plant a church for power, authority, or some foolish desire to have it our way. We plant a church, which is the fullness of him who fills all in all, to see Christ glorified and his kingdom come. As we continue, may we constantly hold before us the reality that this church is not for us to have a local franchise of faithful Anglicanism. There are people we do not know who will come and encounter the living God here. There are many unknown to us who are being summoned even now to come and encounter the reality of our Lord and his grace at his table. There are many with gifts and passions we don’t have, who will come and join in with what God is doing here. As we press on in obedience, praying, fasting, and trusting in his grace, we continue to hold this all loosely, knowing it is the Lord who is the Great Shepherd, the maniacal Sower, and the faithful Harvester. May he bless this work and give us joy as we serve him. The Exodus Church is part of the mainstream Protestant Church in the Netherlands. An imposing figure in black robes and white clerical collar, Mr Hendrikse presides over the Sunday service at the Exodus Church in Gorinchem, central Holland. It is part of the mainstream Protestant Church in the Netherlands (PKN), and the service is conventional enough, with hymns, readings from the Bible, and the Lord’s Prayer. But the message from Mr Hendrikse’s sermon seems bleak – “Make the most of life on earth, because it will probably be the only one you get”. “Personally I have no talent for believing in life after death,” Mr Hendrikse says. “No, for me our life, our task, is before death.” Nor does Klaas Hendrikse believe that God exists at all as a supernatural thing. Postmodernism is alive and well in the Netherlands! Bishop Phillips Brooks was well known in his life for his preaching. As rector of the Church of the Holy Trinity in Philadelphia, he preached to large congregations. He gave a famous sermon (still well worth a read) on Abraham Lincoln the week after his assasination while his body was visiting Philadelphia. It is an interesting example of one pastor not only ministered to his own flock during a time of national crisis but to the entire country. Interestingly, he also wrote the words to the well-loved Christmas hymn “O Little Town of Bethlehem” after having served at a Christmas Eve midnight service in Bethlehem. “The relation between preacher and congregation is one of the very highest pictures of human companionship that can be seen on earth. Its constant presence has given Christianity, much of its noblest and sweetest color in all ages. It has much of the intimacy of the family, with something of the breadth and dignity that belongs to the State. It is too sacred to be thought of as a contract. It is a union which God joins together for purposes worthy of His care. When it is worthily realized, who can say that it may not stretch beyond the line of death, and they who have been minister and people to each other here be something holy and peculiar to each other in the City of God forever?” — “Brooks, Lyman Beecher Lectures on Preaching,” p. 216. He preferred to preach in his academic gown but would vest in surplice and stole when presiding at the Eucharist. Anglicans have rightly been referred to as the people of the book, that is people of the Book of Common Prayer. Our spiritual heritage and our common ground with other Anglicans is rooted in our common prayer and our common liturgies contained in the BCP. 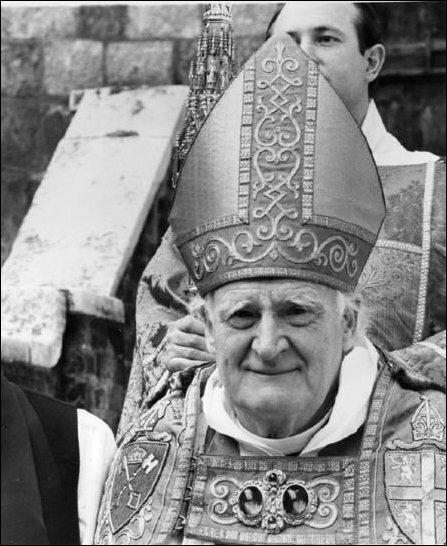 100th Archbishop of Canterbury, Michael Ramsey, noted in his lecture “The Anglican Spirit” that it is the BCP that distinguishes us Anglicans from other continental, reformation movements. Michael Ramsey, The Anglican Spirit, p. 17-18. The Mighty Voice of Christendom! A note from a friend of a friend that I found very interesting. I’d love to know your thoughts. I had an interesting conversation with Elizabeth XXXXXX yesterday that I thought was worth expanding into a written reflection. It seems to me that a lot of people’s faith in God rather closely tracks the vagaries of their personal lives. Something “good” happens to them, and they react by praising and thanking God. Something “bad” happens to them, and they fall into doubt and confusion. Their faith bounces up and down like the stock market. What I’m wondering is, is this the way faith is supposed to be? It’s easy to raise some objections. The stock-market God apparently goes to great lengths to grant us parking places when we want them, while calmly allowing 300,000 people to die in an earthquake—though perhaps saving a few of them “miraculously”. Apparently, the stock market God takes sides in sporting events, deserves the credit for my not being seriously injured in an accident but not the blame for the accident happening in the first place, and can ensure that it won’t rain on the day of the church picnic but can’t (or won’t) prevent a drought that causes thousands to starve to death. Is this really a true picture of the God we worship? Speaking for myself, I hope not. fluctuate along with fluctuations in my personal fortunes. My faith remains high (though not at 100%) regardless of whether something “good” or “bad” happens in my personal life. This approach has the advantage of avoiding the wild contradictions of the stock-market approach. One side effect, though, is that I don’t spontaneously announce “Praise God!” when something “good” happens—say, when a medical test allows me to rule out a serious illness. This isn’t because I’m ungrateful, or because the question of God’s role doesn’t occur to me. The point is that I know that if the medical test had turned out the other way, I would have accepted it with the same equanimity. To me, praising God for a negative test result carries an implicit assumption that a positive test result would *not* have been cause for praising God (or at least that praising God for a positive test result would require finding some silver lining in the cloud). Since I don’t want to promote what I regard as a false view of God’s action, I refrain from exclamations that might be construed that way. rational. Surely I must be failing to engage my heart and my emotions. Surely I lack a vibrant personal relationship with a personal God who cares intensely about my personal life. Surely the believer who exults when “good” things happen and whose faith soars as a result, and who gets confused and struggles in anguish when “bad” things happen, enjoys a much more vibrant and meaningful spiritual life. Surely? Nevertheless, stock-market faith seems so pervasive that I have to wonder if we should regard it as “normal.” That is, someone with a “normal” spiritual life is supposed to engage in soul-searching every time bad things happen, but ignore the deep theological puzzles behind the problem of evil when good things happen and just directly attribute pleasant events to God’s intervention.